If you attended or planned a wedding this year, then you know that glassware is a crucial part of the entire event. Types, sizes, and quantity are just a few attributes that have to be accounted for when using the right glassware for a wedding. It may seem like just a piece of glass you drink from, but wedding glassware can leave a mark on the overall impression of the event. Take for example the movie Sweet Home Alabama starring Reese Witherspoon. There’s a scene where she’s visibly impressed by the stemware created by her ex-husband and wanted to use it in her own wedding. You see similar scenes in other movies where someone smirks or comments at the status of a drinking glass. Simply put, glassware is a big deal. After all how else are you going to tackle that champagne glass waterfall? The easiest way to tackle this challenge is by renting all the glassware. Not only is this option more affordable, it offers a wide variety of options and styles to choose from to make the wedding a hit. Start by contacting your rental dealer as early as possible to get the best price and the most options. Don’t forget to do your homework and take notes from wedding magazines, pinterest, friends who have been married, family, and your experience at recent weddings. Each guest requires at least three sets of glassware and even more if you’re having multiple receptions at your wedding. 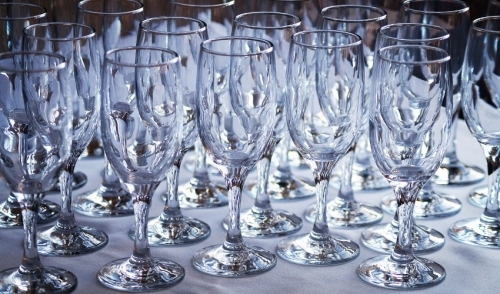 Your caterer may also request additional glassware to be rented for food and drinks to be served. What types of glassware should you rent for your wedding? Start with renting wine glasses, flutes for the champagne toast, water goblets, old fashion glasses for sodas and mixed drinks, pint glasses for beer, and additional wine and old fashioned glasses for the bar(s). These are all considered standard glassware items used at most weddings. Depending on the theme and style of your wedding, you may require additional stemware such as martini glasses, snifters, or even mason jars if you’re opting for more of a farmhouse themed wedding. The great thing about renting the glassware is that makes all of these options readily available to you. You won’t have to spend excess amounts of money and you can customize your options as needed. Work with your wedding planner, caterer, and rental company to achieve the best options available at the best price. Rent your glassware to help you stay under budget for your wedding while also giving your guest something real to drink out of versus plastic. While there are some venues that prohibit glassware, use it where applicable to give your wedding a classic and authentic feel. Make the right choices for glassware at your wedding, and I promise the bride’s dress won’t be the only topic of discussion at the dinner table!